The phonebook of the Nokia Asha 300 will store about 2000 contacts depending on the fields you use, which isn’t as good as unlimited storage but should do for those of us that aren’t that popular. You can set the phonebook to display contacts from the phone memory, SIM memory or both. Adding a contact is simple and straightforward – the phone asks for number, first and last name and that’s it. When you need to add other details you can always go back and edit the contact. The phonebook can be set up to automatically store new contacts in a chosen location (phone, SIM) or to always ask. The phone book has search functionality and kinetic scrolling. Contacts can be copied, moved or deleted either individually or in bulk. The reception on the Nokia Asha 300 was consistently good and in-call sound was crisp and clear, though not as loud as we would have liked. The lack of smart dialing was not surprising for an S40 device. There’s no voice dialing either. Luckily, Voice Clarity and call recording are supported from the in-call Options menu. In a call, the screen automatically turns off thanks to the proximity sensor. There is no turn-to-mute functionality though. We carried out our traditional loudspeaker test to find out that the Nokia Asha 300 scored a Good mark. The strength of the vibration was good too - you're unlikely to miss calls with the Asha 300. You can find more details about our test, as well as the results of all other tested handsets here. 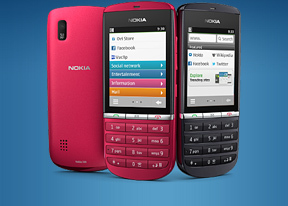 The Nokia Asha 300 comes with the standard (and quite capable) S40 messaging. It can handle all the common message types including SMS, MMS, as well as flash and audio messages and there’s easy email setup, too. The standard Inbox view is available but you also get a Conversations view mode (that’s the threaded message feature). The editor is well organized and you won’t spend too much time finding your way around. Nokia has added four new virtual controls to make up for the missing D-pad – two arrow keys, letter case switch and symbols. Of course you can tap to move the cursor wherever you want, but you’ll still need those two arrows for precise positioning. The symbol and letter case features are also available from the numpad, so there is no real need for them on the screen. When composing a message there’s a character counter and message part counter available and when you’re done you can pick the recipient from the contacts list, the recently used numbers, the call log or contact groups. You can have a favorite contact too (just one). And that's not the end of the messaging capabilities on the Asha 300 either. The Chat app supports Facebook, Google Talk, Ovi Chat, Windows Live Messenger, MySpce IM and Yahoo! Chat. The tabbed UI of the OS is pleasantly thumb-friendly. We wish it had a unified list of contacts from all services though, it would have made finding the right contact easier. There's a Chat widget for the homescreen too.